Ceramic tile is one of the most durable and maintenance friendly surfaces you can choose for your walls, floors, countertops, etc. With proper care & minimum maintenance, it will retain its original beauty and luster for many years. Generally, all that is necessary to keep your tile looking as good as new is a quick wipe with a clean damp cloth or mop. Prompt cleanup of spills and regular cleaning will keep your ceramic tile surfaces looking their best. If a cleaner is necessary, Florida Tile recommends the use of low VOC (volatile organic compound), neutral pH, non-hazardous, and non-polluting products. Glazed tile walls in your home will easily keep their lovely look with simple routine care, just wipe regularly with a clean damp cloth or sponge. A non-abrasive, neutral cleaner can be used (abrasive cleansers will cause scratching to shiny tile and polished marble surfaces). Highly polished tile and stone surfaces should be polished dry with a soft absorbent cloth after cleaning to eliminate the buildup of hard water residue and to maintain the high polished finish. For glazed tile floors, sweep or vacuum regularly to remove dirt and gritty particles. Follow with a mop or sponge dampened with a neutral pH cleaner. If a cleaner is used, be sure the surface is rinsed thoroughly with clean water and dried. For textured or uneven tile or stone surfaces, substituting a soft scrub brush or white nylon scrub pad for the mop or sponge will quicken the cleaning process. Unglazed tile floors and porcelain tile floors can also be maintained in this same manner. Tiled surfaces in your bathroom may require a more thorough routine cleaning because of a build-up of soap scum, body oils or hard-water stains. Use a clean, damp cloth, or sponge with a neutral pH cleaner, allowing it to stand about five minutes before rinsing and drying. Specialty bathroom cleaners may also be used (always test first). Clean shower regularly with the appropriate tile and stone cleaner. Dry with a towel after each use and leave curtain or door open between showers to allow for maximum ventilation and moisture escape. For high traffic areas or when tile has been neglected for a long time, heavy-duty cleaning may be required. Glazed walls and countertops should be cleaned with an alkaline-based cleaner (high pH, non-acidic). Use a white nylon scrub pad, followed by a clean water rinse. Poultice may be used in combination with any appropriate cleaner, if needed, to restore seriously soiled areas. Poultice is a very fine powder that serves as a mild abrasive, yet cannot cause scratching to even the most delicate glazed tile and polished marble surfaces. Unglazed tile and natural stone can be treated in the same manner as glazed when heavy-duty cleaning is required. Once the tile or stone has been effectively restored and is dry, it is recommended that the appropriate sealer be applied to protect from staining and ease ongoing maintenance. To clean badly soiled countertops, an appropriate alkaline cleaner is recommended. Poultice can be lightly sprinkled onto the wet cleaner solution and scrubbed with a white nylon scrub pad or medium nylon scrub brush to facilitate cleaning. Rinse thoroughly. For glazed tile floors, the same products and procedures are recommended. For showers, tub surrounds, or other wet areas, light acidic cleaners are recommended to remove hard water mineral deposits. These acidic cleaners are not recommended on acid-sensitive surfaces such as metallic glazes or polished marble. For acid-sensitive surfaces, a neutral or alkaline cleaner, used in combination with Poultice is recommended. Never use harsh acids such as hydrochloric (muriatic) or hydrofluoric, as these acids, and even the acid fumes, can cause damage to tile, stone, grout, humans and pets! The accepted acids (use sparingly) for homeowners use are mild citric, sulfamic and phosphoric. Always test first for desired results. Wipe clean with a damp cloth or sponge using a neutral, non-abrasive cleanser. Be sure any cleaner residue is removed with a clean water rinse. Clean with alkaline tile cleaner or all-purpose cleaner using a soft cloth. Rinse with clean water and dry with a soft towel. Cast Stone Fixtures and Cast Decors are pre-sealed in manufacturing with water based, liquid silicone rubber dispersed sealer. For re-sealing, the sealing product should also be the same type of sealer for best penetration into existing sealer. 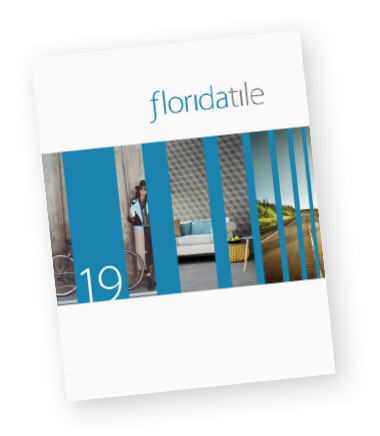 For more detailed information on Glass tile installation and maintenance, visit www.floridatile.com or review the TCNA (Tile Council of North America) Handbook Guidelines.